New OpenType font format was developed jointly by Adobe and Microsoft. OpenType format is an extension of TrueType format. OpenType fonts essentially a container constructed according to the rules TrueType format which may contain both PostScript, and TrueType data. In addition, the OpenType font can contain new data types that were not in the TrueType format. 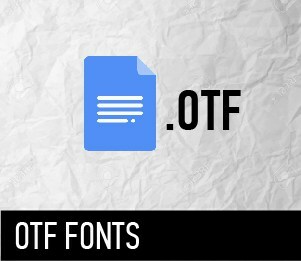 The fonts that contain PostScript data have an extension of the OTF, and fonts based on TrueType – extension TTF. Like TrueType format, each OpenType font uses a single file to store information about the circuits, metrics and service data. The same file can be installed in Windows and Macintosh operating systems. OpenType fonts are based on the multibyte Unicode encoding, which covers almost all world languages. This is an important advantage of the TrueType format are now applicable to the PostScript data. OpenType may have a “digital signature” producer. This signature allows you to determine the origin of the operating system font and see if it has been modified. Like TrueType, OpenType fonts is the so-called “embedded parameter level” ( “embedding flag”). This mechanism determines what restrictions are imposed on embedding fonts in a document for distribution to the document. OpenType fonts use more effective methods of data compression: Compact Font Format (CFF) Adobe PostScript and firms to MicroType Express Agfa company data for TrueType data. Thanks to compression of font files take up less space on the disc and will be sent over the network.